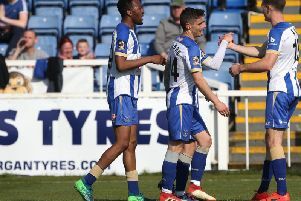 Billy Paynter has questioned Dave Jones’ tactics as the Hartlepool United club captain looks to help lead the team to safety. Paynter has joined forced with defender Matthew Bates, conditioning coach Stuart Parnaby and head physio Ian Gallagher to take charge of the last two games of the season. The gang of four have replaced Dave Jones, who has left the club after just three months in charge, along with assistant boss, Kevin Cooper, and coach, Alex Armstrong. It will be a tall order to revive Pools after shocking displays and defeats to Leyton Orient and Barnet left the club two points from safety with just two games to play, against fellow-strugglers Cheltenham on Saturday then home to League Two leaders Doncaster Rovers. And Paynter, his left foot in a protective boot following Achilles surgery, criticised Jones’ decision to drop top scorer Padraig Amond for Saturday’s game and go with Rhys Oates as a lone striker, assisted by Nathan Thomas and Lewis Allessandra. “I honestly thought we’d go two up top,” the striker said. “I don’t know what the manager was doing, but Oatesy seemed very isolated. “Lewie and Nath were far too deep. If you are playing with three, they have to be closer to Rhys not playing behind the midfield. “Their full-backs were pushing on and that’s when you have to have a bit of nerve and stay up. “When Podge came on I thought that would be a change to two up top for a bit of support? “But it’s all about opinions, that’s how football is. Paynter admitted it was difficult to sit through Saturday’s match – and said he was disappointed with the lack of reaction from the Pools players after the Orient defeat. Now instilled as a temporary assistant manager, he says the club needs ‘men to stand up and fight for the shirt’ if Pools are to survive. “It’s been hard since the injury, no player likes to miss games, especially matches like this,” he said. “I woke up nervous, as if I was playing. “I felt after the Leyton Orient game that we’d be guaranteed to get a reaction.